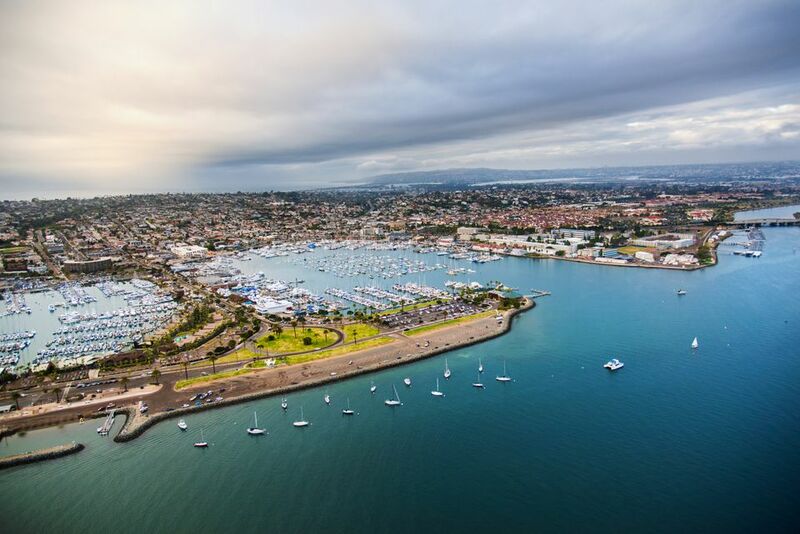 Shelter Island is an area and neighborhood literally on San Diego Bay, adjoining Point Loma. It is really not an island but is connected to the mainland by a narrow strip of land, which technically makes it an isthmus. It is one of San Diego's more popular recreational areas when it comes to ocean activities and is popular with both tourists and locals. Shelter Island was created more than 50 years ago to accommodate the larger ships of the U.S. Navy. The sand dredged up from the bay-deepening process was re-purposed to form the island. It was originally a sandbank in San Diego Bay, visible only at low tide. Eventually, it was built up into permanent dry land using material dredged from the bay in 1934. In the late 1940s more dredging provided a new entrance to the yacht basin, and the dredged material was used to connect Shelter Island with Point Loma. Shelter Island is the home of Polynesian-themed restaurants, hotels, venues, marinas, and public art. The first thing you'll notice is the boats--sailboats, cruisers, yachts plus yacht clubs that the island "shelters." As you drive along Shelter Island Drive, which loops along the 1.2-mile island, you'll see marine dealers and boatyards, island-themed hotels and restaurants, and lots of pleasant waterfront green space. Shelter Island has several notable pieces of public art. The Tunaman's Memorial is a bronze sculpture by Franco Vianello and is dedicated to the tuna fishermen who were once a vital part of the San Diego economy. The Yokohama Friendship Bell is a large bronze bell housed in a pagoda structure, a gift from San Diego's sister city of Yokohama in 1958. Pacific Rim Park at the southwestern end of the island was created by noted artist James Hubbell and is centered on a bubbling fountain called Pearl of the Pacific and is a popular place for outdoor weddings and events. Is It Just for Yacht Owners and Tourists? Well, there are tourist-oriented hotels like The Bay Club Hotel and Marina, Humphrey’s Half Moon Inn & Suites, Best Western Island Palms Hotel & Marina and Kona Kai Resort and Spa, which form the Shelter Island Village. But there's also a very busy public boat launch where local boat owners head out for a day of sailing or deep-sea fishing. There are also relaxing picnic areas along Shoreline Park where you can enjoy the spectacular skyline view. There is also a very popular fishing pier, where locals cast their lines and luck, hoping for a big bite. Where there's a waterfront view in San Diego, there is usually nightlife to be found. One of the most popular restaurants is the venerable Bali Hai. The Bali Hai is one of four dock-and-dine spots on Shelter Island, so if you have a boat, you can motor right up to the restaurant. Other dock and dine restaurants include the Red Sails Inn and the Kona Kai Dining Room. For music and entertainment, there are Humphrey's Concerts by the Bay series during the summertime with one of the best outdoor concert settings anywhere. And nothing is better than an evening stroll along the entire island.